I was recently asked to help facilitate a series of art workshops in a program called “My Life My Dreams”. This program engaged a group of women who were experiencing difficulty in their lives. It aimed to help the women begin to take small steps towards a brighter future, presenting them with a smorgasboard of different learning experiences. I was one of several facilitators who guided the women through a series of creative opportunities including photography (with Dean Golja) and singing (with Karen Ashworth). I shared with the women some of the fundamentals of making with clay and drawing with charcoal and ink. In the clay workshop each of the women made three “pinched” vessels. Each bowl was made in a quiet and meditative manner; shaped by hand from a single ball of clay. Each was made whilst the maker held a different thought or emotion or loved one in her minds eye. They are personal pieces, reflecting the moment in time in which they were made. Bowls are objects through which we receive physical nourishment. I call the pieces the women made “Blessing Bowls”, vessels that celebrate our equal need for emotional and spiritual nourishment. In another exercise the women wrapped jute string around their balls of clay, then “pinched” the shapes around the string. Each vessel is unique, shaped by a random collection of string lines. Blackened by soot in a sawdust firing, each pot wears the signature of fire. These vessels are metaphorical, representing the journey of our own lives. Beginning from a space of perfection (the perfect sphere of clay), we are shaped by experiences, by thoughts and external actions (represented by the string encircling the clay). Sometimes our lives seem to be shaped by random acts or we find ourselves within circumstances that we cannot control (trial by fire, each blackened bowl a testimony to the random marks of smoke and flame). Like the finished blackened vessels, there is a unique and subtle beauty within each of us. In the drawing workshops I hoped that each of the women would discover her inherently creative spirit. Drawing can often be extremely challenging and provoke negative emotions, especially for beginners. It takes courage to draw, in the same way that it takes courage to stand up in front of a crowd and give a speech, to sing or play a musical instrument. When we draw we share a personal part of ourselves in public. We allow a part of ourselves to be scrutinised, open both to praise and critique. It can be unnerving to be so naked. Charcoal is an expressive media, lending itself to large expressive marks on big pieces of paper. Like clay it is “hands on”, organic and tactile. Marks can be smudged, smoothed and reworked. Through a series of exercises, the women’s drawings became progressively freer, more expressive and confident. The ink drawings were made using “home made” brushes. Each woman made her own personal brush with found materials- leaves and twigs bound together with masking tape. Without the barrier of a “real” brush the women could draw in ink with a spirit of fun and adventure. The ink drawings are heavily textured and gestural, full of expressive form and movement. “My Life My Dreams” participants graduated at the end of July. At the celebration I had the great satisfaction of discovering that two of the women had already bought art materials to continue the art journey that I had helped nurture. To each of you who took part in “My Life My Dreams”- Thankyou. In sharing something of what I know about drawing and making with clay, you beautiful, humble women helped teach me more about myself. My sincerest wishes to you all that each of your life’s journey’s becomes less rocky. 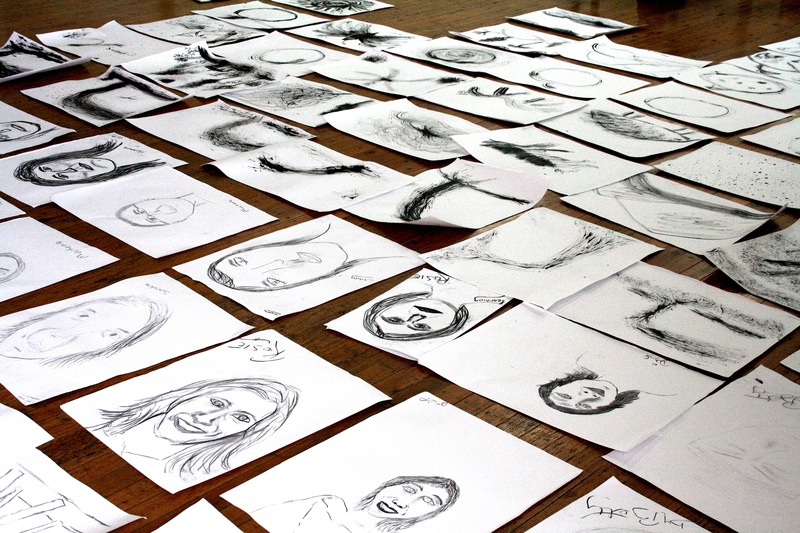 Charcoal and Ink images lined up on the floor of the community centre chart a progression from first tentative marks to more confident, expressive drawings. NextWhere did that Wonga go?